GRAMMY, ACM, CMA, and AMA Award-winning group, Little Big Town -- consisting of members Karen Fairchild, Phillip Sweet, Kimberly Schlapman, and Jimi Westbrook -- first entered the music scene over 20 years ago with hit songs “Boondocks,” “Bring It On Home,” “Good As Gone” and the GRAMMY-nominated “Little White Church.” Their breakthrough albums Tornado and Pain Killer produced multiple #1 singles, including “Pontoon,” “Tornado,” and “Day Drinking,” as well as the history-making, best-selling country single of the year (2015) “Girl Crush.” Little Big Town's last studio album, The Breaker, debuted #1 on the Billboard Country Charts and Top 10 (No.4) on the Billboard 200 to critical acclaim, marking the group’s fourth Top 10 debut on the Billboard 200 chart. The album features their GRAMMY-winning, multi-week #1 single, “Better Man,” as well as the 2019 GRAMMY-nominated, “When Someone Stops Loving You.” The band is currently in the studio working on a new album expected for release later this year. 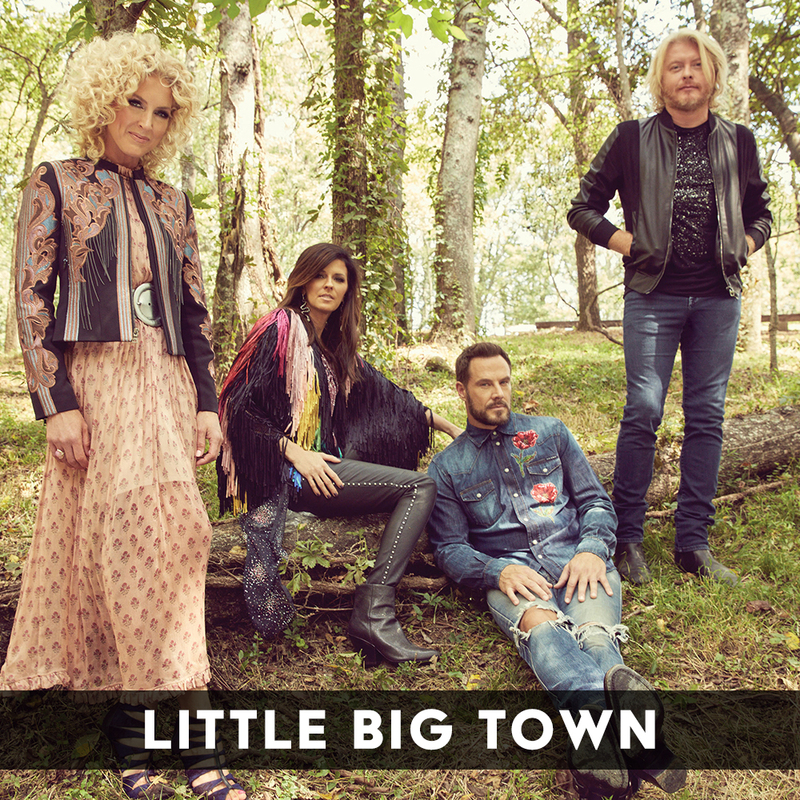 Little Big Town has earned more than 40 award show nominations and in the past five years has taken home nearly 20 awards, including multiple GRAMMY, AMA, People’s Choice, CMA, ACM awards, and an Emmy award. The Country Music Hall of Fame inductees (2014) went onto receive their star on the Nashville Walk of Fame in 2017. This past July, The Country Music Hall of Fame and Museum in Nashville launched their new, yearlong exhibit called LITTLE BIG TOWN: THE POWER OF FOUR showcasing the bands powerful and storied 20-year history within the country music community. The band recently launched 4 Cellars wine, their first non-musical project as a band, with Browne Family Vineyards. For more information on Little Big Town visit LittleBigTown.com or follow them @littlebigtown.